LAS VEGAS u2013 Fujifilmu2019s has further cemented its commitment to bridge cameras by today unveiling a quartet of new models including the u2018weather-resistant FinePix S1. Due out this month priced £399.99, the S1 carries a 16.4MP 1/2.3in imaging sensor, a 50x ‘image-stabilised’ (lens-shift-type) optical zoom. Seventy parts of the camera are sealed against weather, according to Fuji. The S1 (pictured above) offers five-axis image stabilisation and improved 3D noise reduction when shooting video. Its f/2.8-5.6 lens is designed to deliver the 35mm viewing angle equivalent of a 24-1,200mm lens. The lens is built from 13 elements in 11 groups with two aspherical and four ED lenses. Also on board is a 100x digital zoom. A Super Macro mode allows shooting down to 1cm and the top burst rate is 10fps, claims Fuji. Features also include Wi-Fi connectivity for remote shooting via smartphone or tablet, a Focus Peak Highlight function, a 3in (920,000-dot) vari-angle LCD screen, plus a 0.2in EVF carrying the same resolution. An interval shooting mode automatically triggers the shutter at intervals set by the photographer – recording images up to 10 minutes apart for up to six hours. The S1 boasts an AF speed of 0.14secs, and raw file shooting is possible. 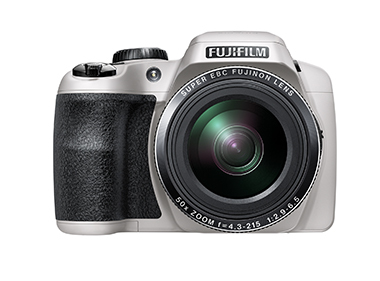 Fuji used CES to roll out two more bridge cameras with 50x zooms in the shape of the FinePix S9200 (priced £249.99 and pictured below); and the S9400W (£269.99) – the latter incorporating Wi-Fi connectivity. The 16.2MP cameras’ newly developed f/2.9 lens includes three aspherical and two ED elements. Image stabilisation is included for video recording. Maximum ISO sensitivity is 12,800 and each feature a claimed AF speed of 0.3secs. They also boast a 200,000-dot resolution electronic viewfinder and 10 filter effects. Meanwhile, the ‘small and powerful’ FinePix S8600 – costing £149.99 and due out next month – includes a 36x zoom (25-900mm equivalent) and sensor-shift image stabilisation. The S8600 is powered by three AA batteries. No-one from Fujifilm’s UK office is attending CES 2014 in Las Vegas.